Editor's Note: The National Transportation Safety Board held a press briefing Monday with new details. Our earlier story appears below. 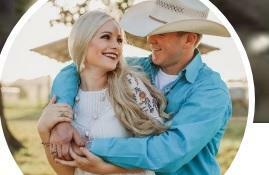 UVALDE COUNTY, Texas — A helicopter crash outside in south-central Texas claimed the lives of two newlyweds who had just left their wedding, reports CBS San Antonio affiliate KENS-TV. Uvalde County Justice of the Peace Steve Kennedy told the San Antonio Express-News Monday that the aircraft was carrying William Byler and Bailee Ackerman Byler late Saturday to a regional airport from where they planned to fly to their honeymoon destination. Kennedy said the helicopter struck a rural hillside, shattering the aircraft and killing the couple and the pilot. Kennedy said the helicopter was owned by William Byler's father but was being flown by 76-year-old Gerald Douglas Lawrence, who had piloted the craft for about 20 years. The Federal Aviation Administration says the crash occurred northwest of Uvalde, which is about 80 miles west of San Antonio. The newlyweds were both seniors at Sam Houston State, according to The Houstonian, the school's student-run newspaper. Uvalde Police received a call from an aviation monitoring center around midnight Saturday notifying them of a possible downed aircraft. Several agencies, including the Texas Department of Public Safety (DPS), the Border Patrol and Uvalde Fire Department aided police in their search for the aircraft. Police said the wreckage was located shortly after sunrise Sunday. The DPS and the Federal Aviation Administration were investigating. The NTSB said the incident involved a Bell 206B — a two-bladed, twin-engine chopper. It's not yet clear what factors contributed to the crash. The National Transportation Safety Board is scheduled to release more details Monday.